* Remaining dinners can be taken at the hotel or one of the unique restaurants in the area. Dinner is served from 7pm but try get yourself to the deck or onto your private balconey first for sundowners. Day 2After breakfast take a transfer down to the Victoria Falls and do a guided tour ( Your own account ) You can enjoy lunch at the Rainbow cafe ( own account ) Take a tour of the market or visit one of the pubs in town. Transfer back to the David Livingstone Safari Lodge and Spa in time to board the Lady Livingstone for a sunset cruise along the Zambezi River. Day 3After breakfast enjoy your day at leisure. Perhaps book an elephant back safari at the Elephant Sanctuary. ( own account ) This 4 hour excursion gives you a view of the bush and surrounds from atop one of the most powerful land animals on our planet. After the rigors of game viewing from the top of an elephant all morning, return to the Lodge and maybe have a relaxing Spa Treatment. Day 4Enjoy your morning at leisure before checking out and transferring across the border at Kasane for a short boat trip, followed by a short walk ( bring comfortable walking shoes ) up to immigration and then to meet your crew at the Zambezi Voyager. Your river adventure begins! The Zambezi Voyager moves between its mooring during the day, giving you the chance of different types of wildlife sightings. 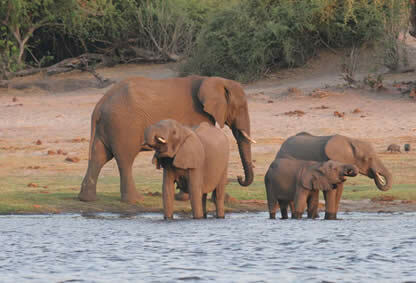 The Chobe is of course famous for its elephant sightings and there is no shortage of these. Watching elephants playing together in water really is a special site and will live with you forever. Another big herd you will see are fellow members of the Big 5, the Buffalo. Huge herds of Buffalo graze and drink on the sides of the river. Not a member of the Big Five but by no means less noble is the Sable of which you are also likely to see plenty. You will not be short of safari photographic opportunity's so be sure to bring extra memory cards! The specially adapted tender boat is ideal to get those perfect shots. Day 5After breakfast enjoy a day of fishing, bird watching, lunch, game viewing and towards day end, sundowners and dinner. All without leaving the comfort of your Luxury safari boat. For birders, you are in a for a treat. Warwick Tarboten, a renowned birder, has compiled a list of over 390 bird species that can be seen from the boats and if you include the birds that can be seen on land safaris in the surrounding area's it would be even higher. Day 6Get up early and go out in your tender boat for a spot of fishing or game viewing. Return for breakfast and hope that your stories are not about the one that got away. River fishing in the Kasai Channel and Upper Zambezi are exactly where you want to be if you like game fishing. While there’s no space for tennis on the Zambezi Voyager they do have their own version of the Grand Slam! All you need to do is catch a Tiger Fish, a Catfish and a Bream in one day. The Tigerfish is renowned and sought out by game fisherman from around the world because of its explosive fighting techniques. They have been known to grow to 10kg in this part of the world. The less than beautiful Catfish can get up to 25kg and the bream get to a more manageable 4kg. The transfer from Vic Falls to the boat can take up 2 hours and is not recommended for clients who are not able physically. We can arrange flights into Kasane if a moderate amount of exercise is going to be of difficulty to you. If the suppliers in this vacation package do not suit you, please contact us to ask for an itinerary that more suits your needs. The activities and itinerary are only suggestions. You can book rafting trips, Helicopter flips, Spa Treatments and other activities for the days and times that suite you and your partner or group. We can easily customise hotel, transfer and other travel arrangements to suit you and your budget. If you would like upgrades, extensionsor tours to anywhere from Cape Town to Zanzibar added. ask us for details. Please discuss your what you would like to do with your reservations consultant. They will be happy to advise on other options. 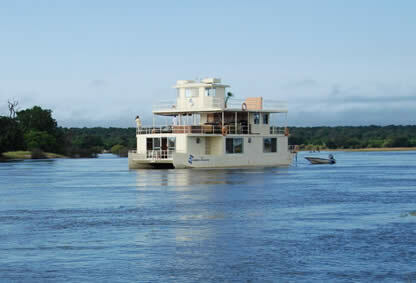 3 Nights at David Livingstone Safari Lodge and Spa and 3 nights on the Zambezi Voyager houseboat. A Houseboat Safari is a holiday like no other and visiting the Victoria Falls is member of most "bucket lists". This is great add on to your longer holiday itinerary or is a relaxing way to enjoy the wild..